Why the second ballot for the bond issue? They waited in line at the Cailloux Theater as they diligently do for every election. Once they arrived at the front of the line at the appropriate precinct table, their ID was checked and they were given a ballot for the midterm general election. Then, they were asked if they would also like to vote in the KISD Bond Election. (Some voters are not asked this question, perhaps if they are outside of the KISD district lines or for some other reason.) Most of our readers requested the second ballot for the KISD election, but they wondered… Why isn’t this just on the regular ballot? Potential ballot confusion. School district lines and precinct lines do not coincide, so within one precinct, you’d have some folks within KISD, some folks within Ingram ISD, or another school district. So within one precinct, the county might have to have three or four different ballots depending on which school district the voter resides in. This could lead to some serious confusion during an unusually busy early voting season. If you live in the City of Kerrville, it’s likely that you reside with the Kerrville Independent School District (KISD). But Kerr County is home to a total of eight school districts: Kerrville, Center Point, Comfort, Medina, Hunt, Ingram, Harper, and Divide. And these school district lines are not drawn on top of voting precinct lines. 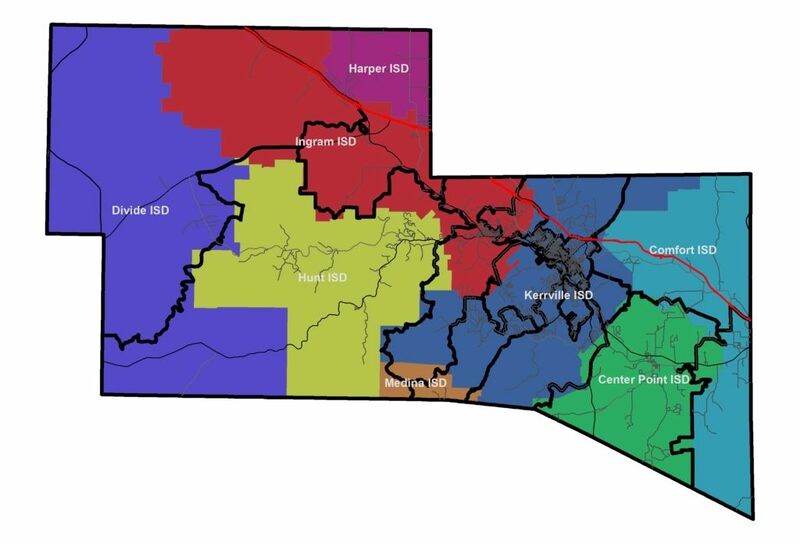 Here’s an image of all eight districts in Kerr. District lines for all eight districts within Kerr County, Texas. And here’s an image of the voting precinct lines on top of those district lines. Precinct lines are shown here in thick black. School districts and voting precinct lines overlaid. As you can see, almost every voting precinct outside of the city limits of Kerrville has parts of multiple school districts within it. So, imagine how many different ballots would have to be ordered to correspond to each voting situation within each precinct! This could be a nightmare to administer with paper ballots on early voting days. In addition to the early voting center at the Cailloux Theater in downtown Kerrville (which is available to all residents within Kerr County), KISD has established early voting centers at various campuses around Kerrville. But be aware… The ONLY ballot that is available at these locations is the KISD Bond Election. You CANNOT cast a ballot for other midterm election races such as Senate, House of Representatives, and statewide races. October 22, 2018 to October 26, 2018 – Polls open 8:00am to 5:00pm. October 27, 2018 – Polls open 7:00am to 7:00pm. October 28, 2018 – Polls open 11:00am to 4:00pm. October 29, 2018 to November 2, 2018 – Polls open 7:00am to 7:00pm. The elections are being administered with separate voter databases. So if you vote at a campus location, you can still cast your other ballot at the Cailloux Theater during early voting, or at your polling place on election day. The bottom line is this… If you live within KISD or one of the other school districts holding elections, be sure and ask specifically for that second ballot so that you can fully participate in the 2018 elections! And if you have any questions, be sure to ask! This entry was posted in Education, Elections, News on October 24, 2018 by Aaron Yates. Most surprising to me is that KISD has maintained a ZERO percent dropout rate for all grades 7-12, compared to the state average of 2-3% dropout rate. However, our district does show that 5.5% of the class of 2014 received a GED instead of regular diplomas, and only 89.5% actually graduated, compared to the state average of about 0.5% receiving GEDs, but higher than the state average for graduates (88.3%). So it appears on its face that instead of letting kids drop out, we’re moving them into GED programs, which is certainly better than dropping out! Apparently, according to my interpretation of these stats, the last time we had ANYONE drop out of high school was back in 2011. One of the only areas where the district doesn’t meet with state averages is when it comes to the percentage of kids participating in advanced courses or dual enrollment courses. While the state average in 2013-2014 showed that 53.2% of students in grades 11-12 completed an advanced course in at least one subject, in KISD that number is only 47.5%. When broken down by subject, we have low completion in Language Arts and Science. The average SAT score for the Tivy Class of 2014 was 1501, while the state average was 1417. The average ACT score at Tivy was 22.3 while the state average was 20.6. For 2012-2013, the state average for high school graduates that enroll in an institute of higher education was 56.9%, while Tivy’s average is just 41.8%. For years 2011-2012, the state average is 57.3% while Tivy’s average is just 37.8%. So we do have some work to do in this area to meet the state average. This entry was posted in Education, News and tagged district, education, kerrville, kisd, report, schools on February 17, 2016 by Aaron Yates.